Hello all. I own a 2010 Montauk 150. I want to add a horn on the side of the console. The console has one accessory rocker switch that I’d like to utilize for the horn. The [unused] switch now is ON-OFF but stays in [the] ON-position I’d like to put a toggle switch so it can’t stay in the ON position. What switch will be a rocker-switch and toggle-switch that can be a horn switch that will be a direct replacement [for the existing switch]? Look at your switch and review the many many variations of the "water resistant Contura switch. Blue Seas, Sea Dog and others all make them. You are look for an off-momentary on switch. BC55--You are confused about switch nomenclature. A "toggle" switch does not mean the switch has a momentary action. Generally the term "toggle switch" refers to the type of actuator used on the switch. A toggle switch typically has a bat handle actuator. The term rocker-switch generally refers, again, to the type of actuator. 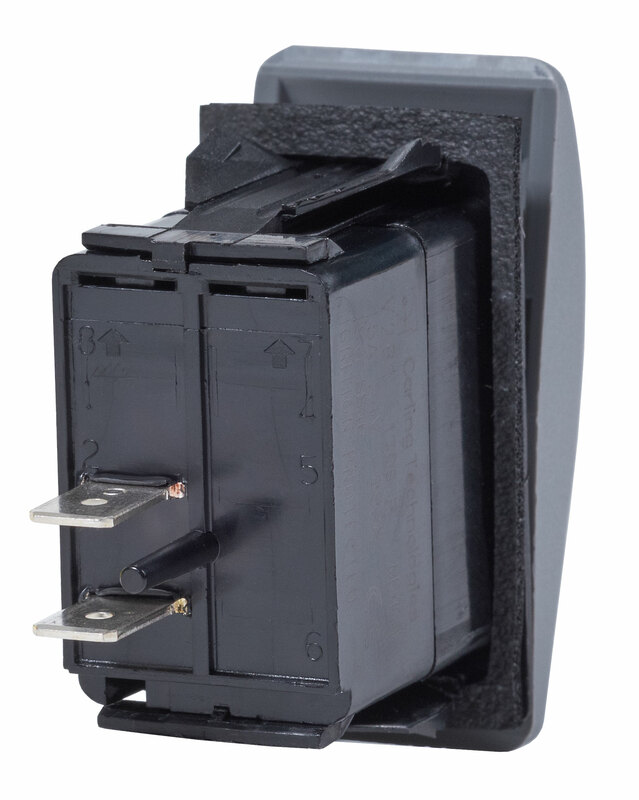 A rocker switch typically does not have a bat-handle or toggle actuator, but has an actuator that rocks back and forth, like a see-saw, between two positions, or in some instances three-positions, with a center or balanced position. Since you have a Boston Whaler boat of recent vintage, the switch on your helm panel is very like a CARLING CONTURA-series marine switch. Among all electrical components, switches can be some of the most complicated to order. There are often a dozen parameters of the switch that must be specified. Inasmuch as I infer you are not an expert in CONTURA switches, you probably won't be able to specify the precise switch you want as an OEM part from the switch manufacturer. To make the switch a drop-in and simple replacement, you would have to get the proper switch series, get the proper switch electrical configuration, get the proper switch action, get the rocker engraved with the proper legend, and get the proper terminals on the back of the switch, get the colors correct, get the illumination option correct, and get the lens color correct. This can be very complicated to specify, and then very expensive and time consuming to order. Disconnect the wiring to the switch (you want to replace) and remove the switch from the panel. Take the original switch with you to a good marine supplier, and ask for an equivalent switch with the switch action OFF-ON(momtary) and with a HORN legend on the actuator. I don't know if the terminals on this switch will match the ones on your Boston Whaler. You can see the terminals in an illustration on the page linked above. Note they are offering both the switch and the engraved cover for a very modest price--and they use genuine CARLING switches, not made-in-China fakes. Thank you for all the replies. I guess my first step is to pull out the accessory switch and take it to the local marine shop to see if they have a matching switch off-on(momentary). I do like the red cover for the horn switch. I will have to look into that. Most important: before you disassemble the wiring to the switch in the console at present, take a good digital image of the switch and wiring, make a sketch of the wiring, and mark all wires with temporary labels. This will allow you to re-connect the new (or old) switch without having to deduce the wiring from a jumble of disconnected wires.